We have a wide range of healthy options available for your employees! 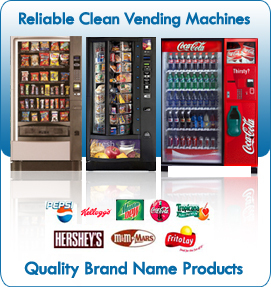 Since 1990, Beltway Vending has been a leading vendor in the communities of Maryland, Washington DC and Virginia as a vending machines supplier of candy vending machines, soda vending machines, snack vending machines, Pepsi and Coca Cola vending machines and food vending machines. When you chose Beltway as your service provider you can be confident that we will meet your breakroom needs with professionalism. We proudly service the Washington DC Metro area.